The edition is taken from the original japanese text. it provides an insight into the mind of the master. I am so happy that I found this book! I did not know about it before finding it on Amazon when searching about conscious upbringing of children. I have known about the Suzuki method of teaching young children to play violin for a long time, and always felt it is such a wonderful gift to the world of music and teaching. I have witnessed my own niece study the violin using this method when little and go on to become a very accomplished player. 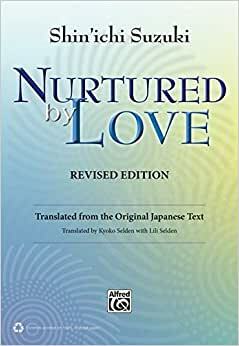 But what I love most about this book by Suzuki is his enthusiasm and his deep, yet straightforward philosophy on raising children to refine their sensibilities and nurture their hearts. He calls it "Talent Education" and shows how children are not actually born with innate talent but that talent (and very advanced talent) can be nurtured and guided and built upon. He also calls it the "path of art". He proves the validity of his philosophy through experience, anecdotes about his students and through his own clear way of expressing his ideas. Highly recommended for everyone especially those who care about nurturing the "light of humanity" which is how he refers to children. A must read for every Suzuki teacher, parent and music educator working with young children. I am a Suzuki Method violin teacher who studied with Dr. Suzuki as a child, and I live by his teachings and philosophy in my teaching and personal life every day. I have two small kids of my own, and it reminds me to patient and kind everyday, and learn at their own pace. Dr. Suzuki believed in the idea that "Every Child Can", and like learning a language, by starting a child in music at a young age in a nurturing environment, with repetition, small steps and encouragement, you can produce a successful musician with a beautiful heart. Even if you aren't about to start your child in music lessons, it is a great parenting book for moms. This book should be on someone's best seller list. If prospective parents had to read it Pryor to being parents the children would be among the high performers any where hands down. I wish someone had given me this book before my first child was born. A very beautiful, inspiring view of life and human potential. Excellent book! Would recommend to all parents, and not just the music educators.